When traveling in Japan, you will find a wide variety of accommodation, ranging from luxurious to cheap, western or Japanese style. In the Seto Inland Sea Area, the big cities offer the whole spectrum, but on the islands, you will mainly find small-scale facilities - inexpensive, sometimes offering very simple style. It is worth trying Japanese style accommodation at least once to experience not only the richness of Japanese cuisine, but also the lifestyle without shoes, with tatami (traditional Japanese mats made from woven straw), futon and Japanese style bath. Below is an introduction to the types of accommodation you will find with examples. 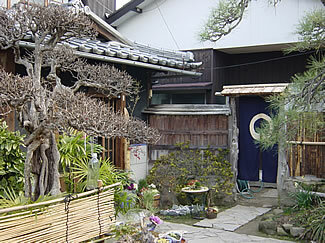 Ryokan are the main type of Japanese style accommodation; they vary largely in price and service. Prices normally include dinner and breakfast. From about 10.000 Yen, you can find a comfortable tatami room with individual bath and two delicious Japanese meals. Some Ryokan offer buffet style breakfast, which includes western food like bread, bacon and eggs. Even if you have a bath in your room, you really shouldn't miss the chance to take an invigorating and relaxing dip in the large common bath - sometimes outdoor baths are also available. Lodges include mainly facilities run by prefectures, towns or villages. Some public Japanese style lodges are located in National Parks and offer spacious rooms for reasonable prices (Yuge). Others make use of old schools (Omishima). In Okayama prefecture, you will find the International Villas (Shiraishi), interestingly designed buildings in beautiful locations were foreigners can not only stay cheaply but also cook their own meals. Camping can be found close to some beaches (Setoda, Miyajima, Shodoshima). Campsites often offer rental tents and equipment. In Setoda, you will also find a log-house campsite affiliated to the KOA-Group. Off-site camping is not allowed in Japan.